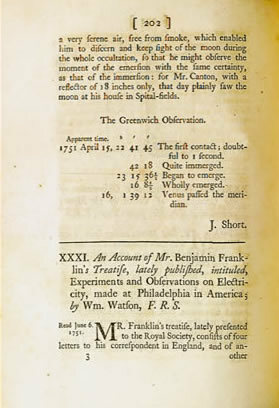 "An Account of Mr. Benjamin Franklin's Treatise, Lately Published, Intituled, Experiments and Observations on Electricity, Made at Philadelphia in America; By Wm. Watson, F. R. S." Philosophical Transactions of the Royal Society of London. 1751. 47: 202-211. In addition to his notoriety as a skilled politician and prolific writer, Benjamin Franklin also made a number of significant scientific contributions. Foremost among these was his kite experiment that proved that the electric nature of lightning and the invention of the lightning conductor. Five editions had been published by 1769, along with numerous commentaries. The present article by William Watson, a British scientist credited with concurrently developing similar theories about electricity, was written in support of Franklin's treatise.